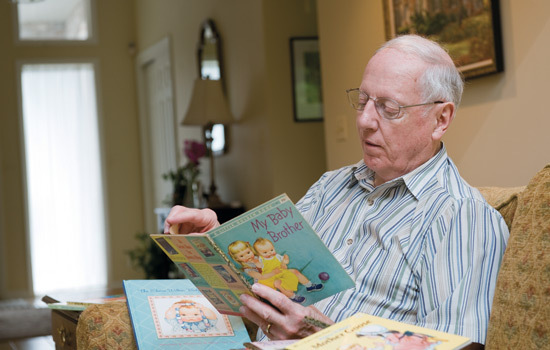 Sidney Wilkin reads a Little Golden Book illustrated by his mother, Eloise Wilkin. 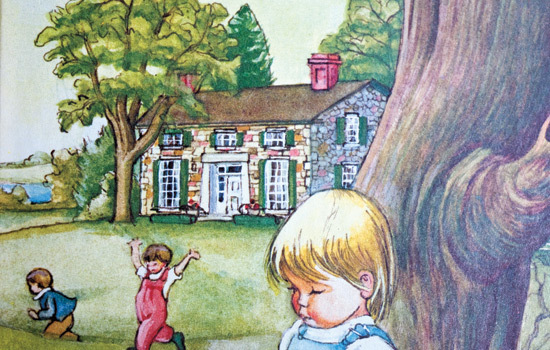 In one book, happy children run and play in front of the fieldstone house with green shutters. In another, Jack and Jill walk toward the same house to fetch a pail of water. The house, which was featured in many Little Golden Books, was the home of illustrator Eloise Wilkin, a 1923 graduate of the Rochester Athenaeum and Mechanics Institute, now RIT. The house in Canandaigua is now the home of College of Applied Science and Technology professor Jennifer Schneider, who lives there with her husband and two daughters. “I think it is very funny that a house known for artistic things is owned by a couple of geeks. I actually flunked art,” says Schneider, who teaches safety and environmental management. Her husband, Tim, is a civil engineer. When the Schneiders purchased the house on Parrish Street Extension in 2006, they had no idea that a previous owner had RIT connections or was a renowned children’s book illustrator. The Schneiders had been living in a townhouse built in 1974 in the Rochester suburb of Brighton. The antique lovers were looking for an older home. They had admired this Canandaigua home 30 minutes from Rochester for years, but it wasn’t on the market. William Gorham built the house in 1832. He was the grandson of Nathaniel Gorham, who with Oliver Phelps purchased the rights to land in western New York. In 2004, after being owned by one family for more than 40 years, the house went up for sale. In May 2006, the Schneiders moved in. They learned about the Wilkin connection after closing on their Brighton home. “If you look through her books, a lot of the details in them were everything she had in that house in Canandaigua,’’ says Wilkin’s son, Sidney C. Wilkin, who lives just outside Rochester in the suburb of Pittsford. The Wilkin family lived in the house between 1945 and 1961. Sidney Wilkin says his mother and father were also antique lovers. They saw an ad in the paper, drove by the house and knew they had to buy it. After graduation, Eloise Wilkin opened an art studio in Rochester with her former classmate Joan Esley. But, according to an introduction in a collection of Wilkin’s work written by Wilkin’s daughter, Deborah Wilkin Springett, they couldn’t get enough work so they moved to New York City. A week later, Eloise Wilkin was hired to illustrate The Shining Hours for Century Company. In 1930, Wilkin put her career on hold and married Sidney J. Wilkin. They had four children. In 1944, a year before moving to the house, Wilkin signed a contract with Simon and Schuster to illustrate three Little Golden Books a year. Sidney C. Wilkin remembers his mother working from 8:30 in the morning until 9 at night when a deadline was approaching. “We would run in and out of the house by her studio and she would stop us, show us something and ask if we liked it,” he says. The house, which the Wilkin family and previous owners called Oak Hill, also became a gathering spot for Wilkin’s former classmates, who would meet in Canandaigua every summer to critique each other’s work. One classmate and Erie Canal artist, J. Erwin Porter, painted a picture of the house, which now is on Sidney Wilkin’s wall. Eloise Wilkin died Oct. 4, 1987, but today is one of the most collectible Golden Book illustrators, Springett writes. The Schneiders, who are the sixth owners of the home, know they are living in a special place and appreciate that previous owners preserved Wilkin’s stencils on the mantels. Eloise Wilkin ’23 (art and illustration) illustrated more than 110 books, including 50 Little Golden Books published between 1946 and 1975. Wilkin also designed dolls and is known for the Vogue Baby Dear doll. In 1990, the Wilkin family established the Eloise B. Wilkin Illustrator’s Scholarship in recognition of their mother’s creativity and contribution to the field of illustration and children’s literature. The scholarship is awarded annually to an illustration or medical illustration student at RIT.